Originally from Argentina, “Pato” began his passion for cooking in 1992 when he joined the Las Leñas Ski Resort’s Due Restaurant in the city of Mendoza. From that moment forward, his great love for gastronomy arose until the development of his characteristic stamp- a passion based on regional products of local origin, combined with a palate of complex flavors. He has acquired this talent throughout his different trips over 25 years of experience in the kitchen. He has worked in renowned restaurants in France, Italy and more recently in his own restaurant, LatitudN in Palma de Mallorca, Spain. Herbs, flowers, local produce and flavored oils are the basic ingredients used to prepare each of his exquisite dishes. 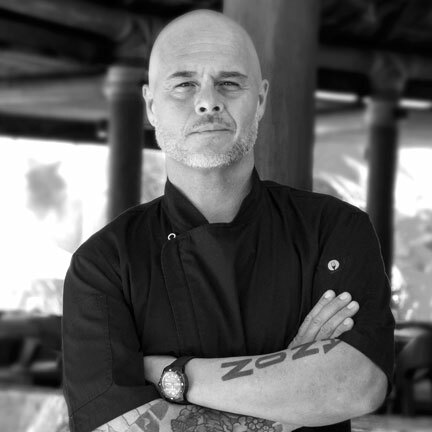 Currently, in Punta Mita, this chef is behind the creation of the notoriously Mediterranean menu offered at Kupuri Restaurant. He is also the Executive Chef of Punta Mita Beach Clubs.